Formed in Nebraska in 1987 by a group of teenagers, they keep the midwestern heart with a functional style. All the pieces are made from organic and sustainable and conventional fabrics and now created in Georgetown, WA. 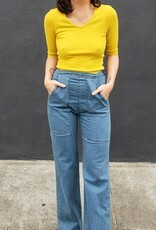 Model is 5'5" and normally an xs. She is wearing a small.